Nearly 200,000 years ago, at the confluence of two long-vanished river systems in the heart of Arabia, people climbed a jagged, rocky dyke rising nearly 200 feet above the surrounding plains. There they crafted hand axes and other edged tools from plentiful volcanic stone—and left thousands of them behind. Today, many millennia after the more temperate Arabia the toolmakers knew vanished, those stone tools endure as tantalizing clues to the mysteries of human evolution and migration in the ancient world. In this week's Scientific Reports researchers describe an array of large flakes, hand axes and cleavers, and date them to some 190,000 years ago. The work presents the first secure dates for Acheulean technology in Arabia. “The exploration of Arabia goes back to at least the 1940s, if not before, but none of the sites have dates, and they are all found on the surface. So this is really important and exciting,” says George Washington University paleoanthropologist Alison Brooks , who wasn't involved in the new research. Such tools can tell us quite a bit about the long-vanished people who made them, and they raise some intriguing questions as well. Our early human ancestors began using simple stone tools, like hammerstones, some 2.6 million years ago. But they took a technological leap 1.76 million years ago when people began to shape stones by striking flakes around their edges to create cutting tools like the hand axe and cleaver. These types of tools came in so handy for routine stone age tasks like chopping wood and butchering animals that the style— known as the Acheulean toolkit —lasted for perhaps 1.5 million years. Acheulean tools appear soon after the first fossil evidence for Homo erectus , about 1.9 million years ago, and our ancestors still used the same types of tools as recently as 250,000 years ago before they developed new Middle Stone Age innovations like spear points, awls and scrapers. And because surviving hominin fossils from this ancient period are relatively rare, durable stone tools are an excellent way to recreate the paths our ancestors took to spread around the globe during the long eras of human evolution—particularly in a geographical crossroads like Arabia. In the 1980s, Norman Whalen and colleagues found and described more than 8,000 buried Acheulean artifacts at a dyke near the village of Saffaqah in the Dawadmi region of central Saudi Arabia. At that time, they were unable to date them precisely. 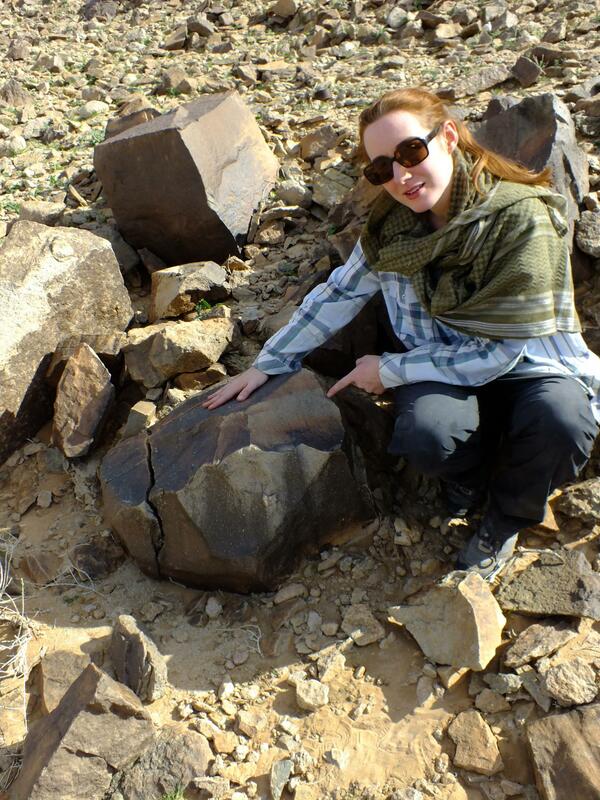 Archaeological scientist Eleanor Scerri and colleagues with the Paleodeserts Project began to revisit the Saffaqah site in 2014. “Once we had located and cleaned up Whalen's trench, we extended it and made a detailed assessment of the stratigraphy, recovering over 500 new artifacts in the process,” Scerri explained in an email. “Since Whalen had recorded X, Y and Z coordinates for every single one of his finds, we were also able to link them into our new stratigraphic sequence.” The team then determined ages by carefully dating the sediment layers containing artifacts and those below them. Scerri now knows when people dropped their tools on the barren ridge, but she can only speculate as to just who they were. “The hominins responsible for the Acheulean at the site made their way into the heart of now arid Arabia by following lake and river channels. Once there, they climbed up the largest dyke, which was also a source of raw material,” she says. The toolmaking site they created there, perched at a lofty vantage point from which they could observe the surrounding plains, hints at how they may have thought and lived. “We don't know which hominin taxon made these tools, but what we can say is that the hominins were resourceful and intelligent,” adds Scerri, of the Max Planck Institute and the University of Oxford. Comparing Saffaqah's stone tools with those from other times and locales presents an interesting puzzle. They bear a strong resemblance to those found in African Acheulean sites such as Ethiopia, suggesting a possible migration from the Horn of Africa by following the era's African Summer Monsoon. The tools are also technologically similar to those found in other surface sites around Arabia, suggesting that the people who made them may have used the ancient river system corridors to travel widely across the area, according to the new study. But on the timeline of human history, the tools are rather young for their Acheulean style. 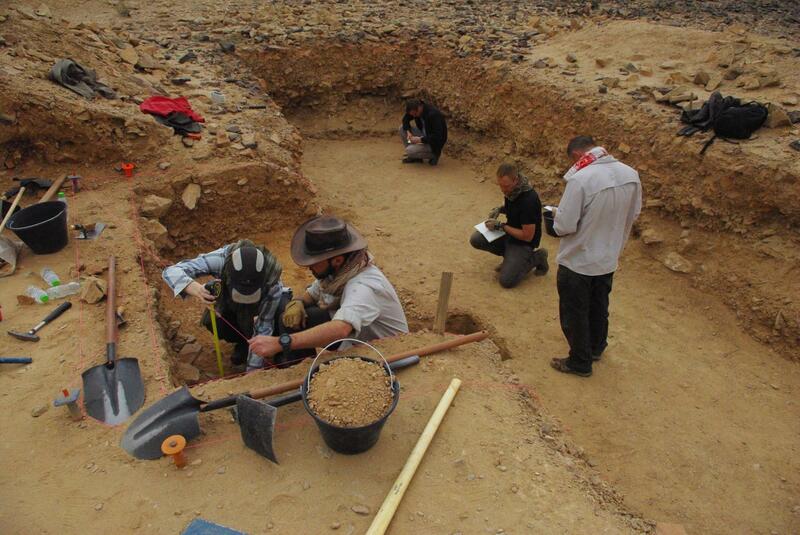 At 190,000 years old, they represent the youngest Acheulean site in Southwest Asia. Most sites of similar age in neighboring areas like the Levant, Ethiopia, Eritrea and Sudan aren't Acheulean at all, but more advanced Middle Stone Age industries, Brooks says. Most of the exceptions, where Acheulean tools are younger than about 270,000 years old, are found in northeast Africa, where their style is similar to that seen at Saffaqah. That connection might support the authors' idea of a migration from the Horn of Africa—or it may not. Scerri's group doesn't have the answers, but she says their findings add to an emerging picture of a prehistoric region between Africa and Eurasia that appears increasingly diverse.